It generally requires two visits to our dental office to make and place a dental crown. Dr. Marvin Herschfus, our talented dentist, will send molds and impressions of the tooth to a dental laboratory for creation. We will gently reshape your tooth to accommodate the size and thickness of the crown, and we fit a temporary crown over the tooth in the interim. 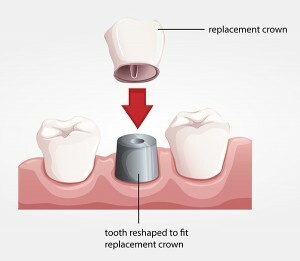 After ensuring the permanent dental crown fits properly, we will cement it into place. For more information about dental crowns and how they can benefit your smile, we invite you to contact our dental office. We look forward to caring for your smile!